Well, I did it again!! I fell down on my duty as communicator. I owe you all an apology for my lack of communication this year. I’ve got all kinds of excuses: my mares, first and foremost, but then the weather, and events at the farm, and my attitude and laziness about getting around to communicating something, etc., etc., etc. But, I am The Barking Shark and should have some privileges (as well as to be allowed to make excuses)!! However, although I haven’t communicated anything, I’ve been doing a lot of thinking and observing and recollecting. So, I’m on my soapbox again. I don’t get on it too often any more. (It’s too hard to get up and down!) But, when I do, I have a message to convey and a purpose for doing so. Many of you won’t identify with what I’m trying to say, which is unfortunate, because it’s a BIG message from us, the horses with whom you deal, whether on an occasional or daily basis. We’re really pretty silent about our feelings, hurts and objections, but there are times when we express our feelings that need to be recognized, acknowledged and heeded. As I’ve said before, all too often you “discipline/punish” us unreasonably for something. Either you haven’t explained what you want adequately for US to understand, or we have a physical or emotional problem dealing with it, which YOU don’t understand. We really do try to express ourselves, but there aren’t enough of you people out there who want to listen to us and our reasonable objections and complaints. So, now I’m retired and enjoying my two mares, but there are others out there like me, who need retirement and protection from further injuries. They may be trying to get the message across in our own way of expressing things, but you people may not understand what we’re trying to say, or worse yet, you may not care. If we’re not cooperative, there’s usually a good reason for it. If we refuse, we usually have a reason. If we’re overly fractious, we usually are trying to tell you something. Just try to listen to what we’re saying. 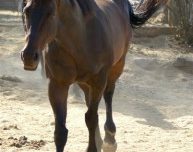 A happy and pain free horse is almost always willing to try to comply with the requests of the rider whether on the track, eventing or on the trails, or any other discipline. 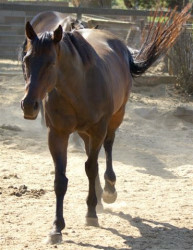 A horse who has physical or mental problems will often object. Please read our signs!! We’re really eager to please, but if you ignore what we’re trying to tell you, we have to protect ourselves. You’d do the same!! Don’t get me wrong. I know there are those of us equines who are just plain obstinate about doing something when asked. I’m not defending them, if they don’t have a physical or emotional excuse for their attitude. They do need to be brought into line. But for the most part we’re really pretty cooperative IF we know what you’re asking us to do. We’re really lovers, not fighters, given the right treatment. But I’m getting off my important message and drift. There are LOTS of us, like you humans, who have physical problems. Some are worse than others. Some of us deal with our aches and pains better than others, just like you people do. Most of us learn to cope. We have a natural survival instinct that allows us to protect ourselves and recognize our innate abilities and our weaknesses when they arise. Some of us have problems that you people would like to “fix”. However, sometimes the “fix” is more life threatening than leaving things alone, if we’re coping with them okay. Why do you people think that you always have to “fix” something? If it’s working and we’re dealing with it comfortably, don’t introduce a complication! There are a lot of people who walk with a limp or use a cane or walker. Unfortunately we don’t have the option of using a cane or walker, but many of us get around fine with a limp. If it becomes more serious or life threatening, then you can go for more aggressive treatment, but don’t always feel that you have to “fix” us because we’re not perfect. If we’re coping adequately, leave us alone on that level. It’s kind of like you humans. If an elderly person has a problem, do you go for surgery or try to remedy/cope with the problem without the surgery due to the risk factor? Usually you wait. So why don’t you people try to read our signs and understand what we’re trying to tell you? We really do express ourselves quite clearly if you’d only observe and listen. These are only my opinions from “The Barking Shark”, but as a voice of authority, I hope you’ll hearken up. I’m only looking out for my brethren and trying to get a common ground for understanding our expressions of pain, fear or other problems. I’d like to think that we’re all on the same page. Take good care, and good care of us. If you think treatment of us for something is necessary, think it through completely. What are the possible consequences? What can go wrong? Is it necessary to make us feel better, or will it make you people feel better for doing it? Does it really need to be “fixed”? Think of your old saying, “if it ain’t broke, don’t fix it!” Sometimes it is best to leave well enough alone. Don’t get me wrong. I’m not saying to not treat an emergency or life-threatening situation. By all means call the vet, but make sure you understand what the vet is doing and that the vet has considered the options and consequences too. Don’t be too quick to euthanize us, if it’s a curable problem and if we show the will to live. Some of us do, and some of us don’t tolerate pain or discomfort well. There again, that’s when you have to understand what we’re trying to tell you. My suggestion is, when in doubt be conservative, if it’s not life-threatening. There’s tomorrow to make the final decision, but euthanasia has become all too popular, and it’s VERY final. You can’t change your mind after the injection is given. Also, if you choose to euthanize one of us, please do it humanely. Let the vet give us that extra bit of sedation before the lethal injection. It costs a few dollars more, but aren’t we worth that? I should hope so!!!! Now, on a happier note, I have to go tend to my mares. They don’t like it when I ignore them for any length of time. But, before I step down off my soapbox, I want to wish you all a VERY HAPPY HOLIDAY SEASON. Please be sure to stock up on carrots, cookies, apples and peppermints for us horses for the Holidays too.